My sister recently told me about these rolls. This is an old Taste Of Home recipe that she found and decided to try. She said that they were really good. 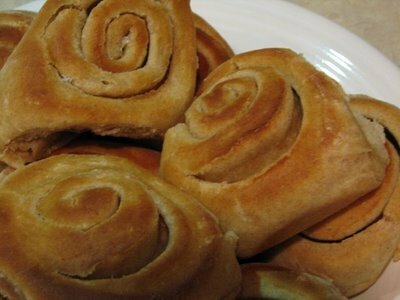 I am always looking for different bread and roll recipes, so I gave it a try. She was right this recipe is really good, especially for whole wheat. They have a good texture that is soft for a whole wheat roll. It is also very easy and you can make it ahead of time. I did alter the directions a little by not making them in muffin tins, but besides that I made them like the recipe says. I will definitely be making these again. In a large bowl, dissolve yeast in warm water. Add 1/2 cup butter, honey, salt, eggs, whole wheat flour and 1/2 cup all-purpose flour. Beat until smooth. Stir in enough remaining all-purpose flour to form a soft dough. Do not knead. Place in a greased bowl, turning once to grease top. Cover and let rise in a warm place until doubled, about 1 hour. Punch dough down. Cover and refrigerate overnight. Punch dough down. Turn onto a lightly floured surface; divide in half. Roll each into a 15-in. x 8-in. rectangle. Brush with remaining butter to within 1/2 in. of edges. Roll up, jelly-roll style, starting with a long side; pinch seam to seal. Cut each into 15 rolls. Place rolls, cut side up, in greased muffin cups. ( I did not make these in muffin cups. I made these in pans like I would make cinnamon rolls.) Cover and let rise in a warm place until doubled, about 45 minutes. Bake at 400° for 8-10 minutes or until golden brown. Remove from pans to wire racks. Brush with additional butter. Whole wheat rolls work for me.